The Fort Wilderness R.R. story. Carolwood Pacific Historical Society Governer and owner of the #4 engine and one coach .Michael played a big roll in saving the Fort Wilderness equipment. He also played a vital roll in the Wilderness Line G scale engine and coach offered by Carolwood. The day after the Roger Broggie rededication in October of 2003, Michael gave a fantastic presentation outlying the history of the FWRR in Pioneer Hall. Michael was also kind enough to provide most of the material to get this web site started. Without Michaels help, this site would not be here! Michael Broggie Son of Roger Broggie and Author of Walt Disney's Railroad story. 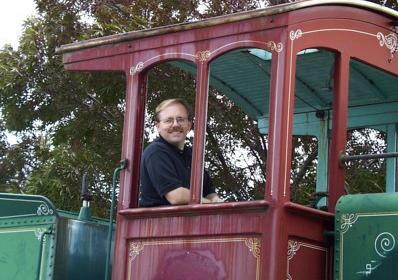 While conducting research for his book, Michael found the dilapidated Fort Wilderness trains in a Disney bone yard. Michael initiated the plan to save the Fort Wilderness trains. Roger Broggie Jr. Also the son of Roger Broggie, Roger Jr. oversaw the building of the Fort Wilderness trains at MAPO in Glendale CA. Their father, Roger Broggie, was Walt Disney's first imagineer. 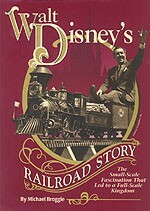 Roger worked closely with Walt Disney on many projects, and supervised building of Walt's backyard miniature railroad. This miniature R.R. inspired Walt to build Disneyland. Walt Disney Worlds engine #3 is named the Roger Broggie in recognition of his contributions to Disney. Roger was also head of MAPO, which built all the Fort Wilderness engines and coaches. 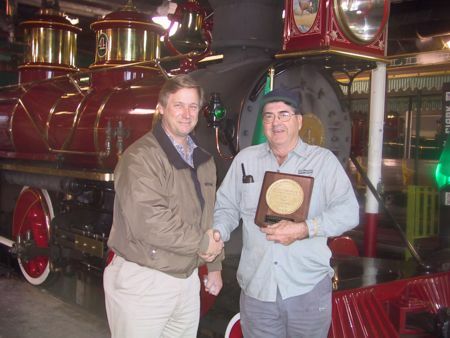 Bill Dundas (left) presents George Britton (right) with a Fort Wilderness Railroad builders plate in recognition of his efforts to preserve the Fort Wilderness trains. George Britton George has been foreman of the Magic Kingdom RR since opening day in October 1971!!! George often helped with the Fort Wilderness RR during it's period of operation. George oversaw the track upgrade to the entire Fort Wilderness line in 1976. If your ever lucky enough to meet George, you will never forget him. He's a great guy! Bill Dundas Carolwood member and owner of Fort Wilderness engines 2 & 3, plus several coaches. 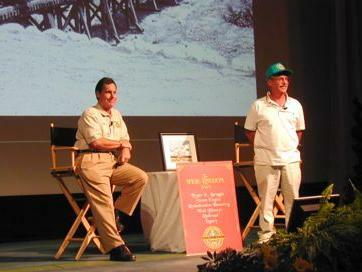 Bill played a critical roll in saving the Fort Wilderness trains. Although many had worked on acquiring the trains from Disney, Bills persistence did what many considered to be impossible. Jim Zordich Owner of engine #1 and one coach. Jimmy Graves Forman of the Fort Wilderness Railroad. David Rose Historian and collector of the Fort Wilderness Railroad. Also Webmaster of this site. David is dedicated to keeping the memory of the Fort Wilderness Railroad alive.